Ramen is not something I’m used to going out of my way for. I have a massive sweet tooth so when it’s my turn to decide where to eat – it’s usually for dessert. Last night, Ben had a craving for ramen so we headed out for date night. 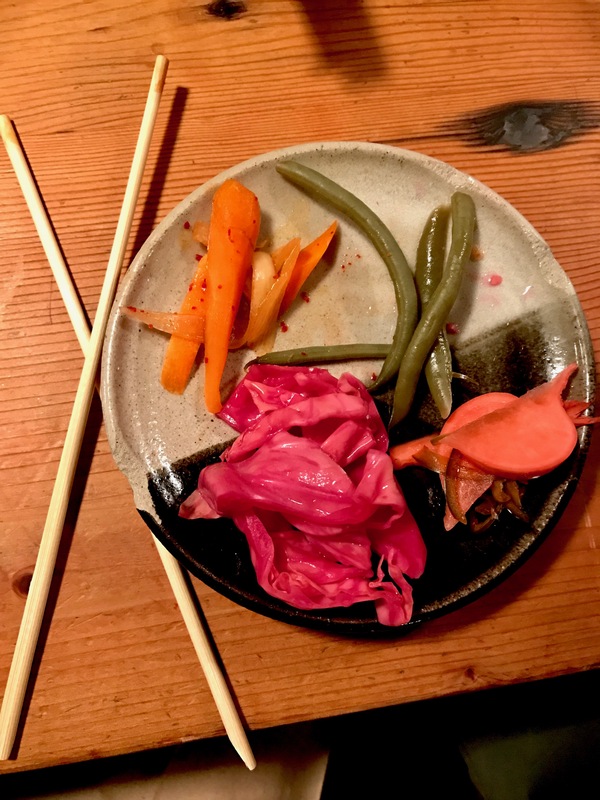 Right down the hill, sandwiched in the heart of the Rockridge neighborhood in Oakland, CA, lay an unassuming but super yummy spot, Ramen Shop. We always go early on for dinner service and by the time we arrived shortly after 5pm the place was already starting to fill up. This is a great sign for a restaurant you’re trying for the first time – it means people like it enough to leave work early. I mean, who doesn’t love a good pickle plate? 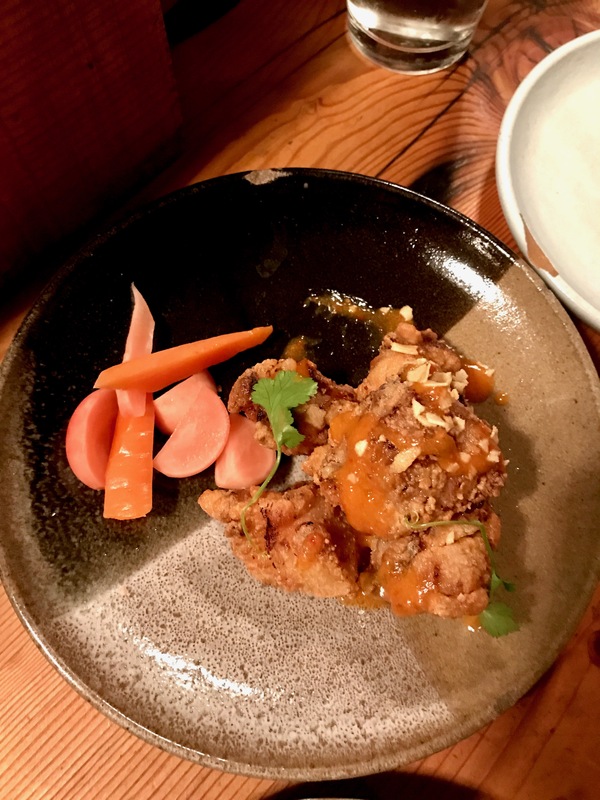 Next up, we ordered the Spicy Chicken Karaage – with fermented guava chili sauce and glardiniera pickles. The chicken was perfectly tender and not crazy spicy. I can’t handle too much heat, but this had just the right amount of kick. Plus, my Atlanta roots keep me ordering fried chicken anywhere I find it. 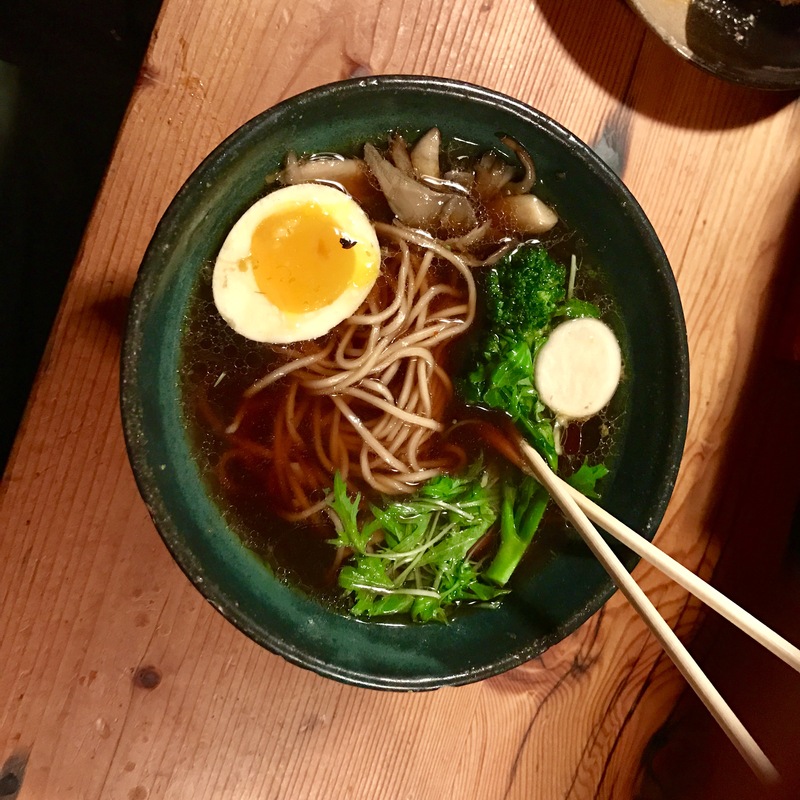 Finally, we both ordered the Veggie Meyer Lemon Shoyu Ramen – with a salt-cured egg, maitake and king oyster mushrooms, broccolini, shaved Toyko turnips, roasted purple carrots, and mizuna. Holy God, this was SO SO GOOD! The broth is something I’ll be dreaming about for a while. I’m glad this place is close! 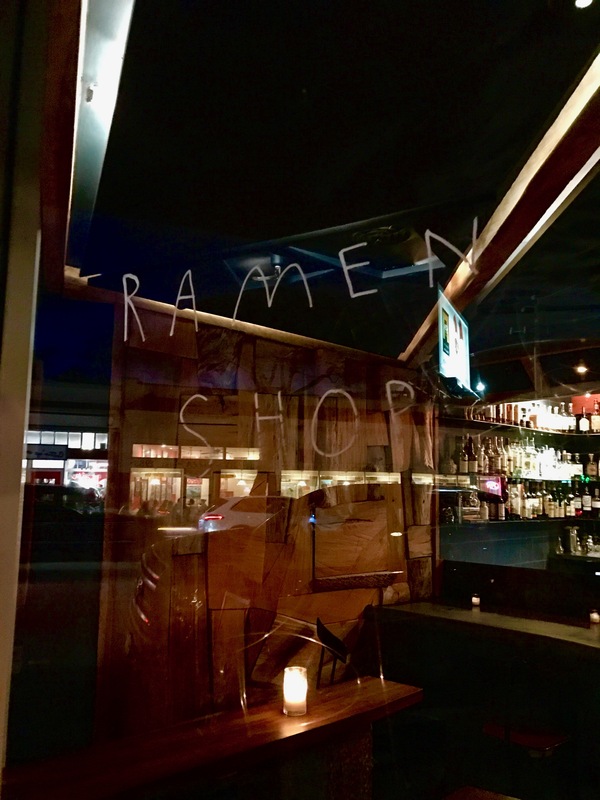 Ramen Shop is a great date-night spot. 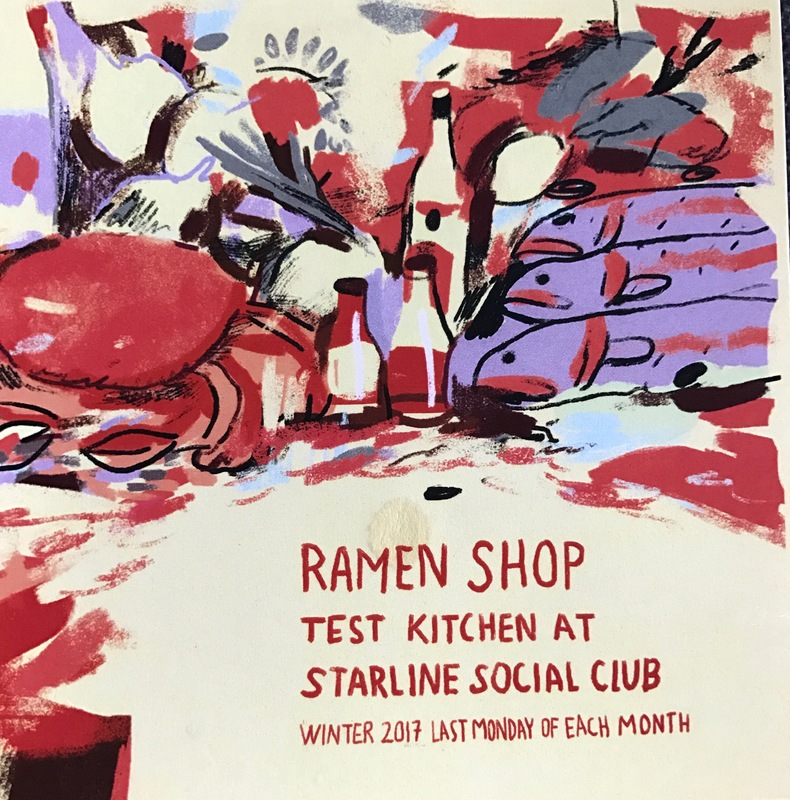 They’ll do a pop-up test kitchen at Starline Social Club in Winter 2017. “You don’t need that…but it does make it WAY better,” Ben said as he put the finishing touches on his chicken recipe, so detailed that it reads like a novel. ‘A Good Cook’ is an important element of the perfect Taco Tuesday. Ben McKee has taken my Taco Tuesdays to the next level. This man is passionate about cooking, and he agreed to share his recipe for the best chicken I’ve ever tasted. He’s a musician by trade, but he was certainly a Michelin star chef in a past life. Check out his recipe below! Ben can cook a chicken in fifty million ways. All of them delicious. The recipe below is for the chicken pictured above. This method is really more like baking on a grill, and the seasonings can be changed to suit your taste or to feature any aromatic ingredients that you might happen to have handy. I’ve only done it on a charcoal grill, so that’s the cooking method I’ll describe here, although I suspect it would be quite a bit easier on a gas grill, I believe that it would lose that delicious smokiness that the charcoal gives it. – Charcoal for your awesome charcoal grill, hopefully a Weber. – Get your chicken at least a day in advance. Remove the neck and innards. Save them if you’re planning on making a stock with your chicken bones. (The liver will bitter your broth! Fry it up with some onions instead). – Rinse the chicken well, inside and out, and dry THOROUGHLY, inside and out. You want dry skin so it will be crispy golden delicious when you take it off the grill. – Sprinkle the chicken generously with coarse salt and pepper, inside and out, and put it in a large bowl, breast side up. You want visible salt crystals sprinkled evenly atop the chicken skin. – Put the chicken in the fridge UNCOVERED for 24 hours. (48 hours is even better). – Take the chicken out a couple of hours before you plan to cook it to allow it to come to room temperature. – Combine butter, onion, garlic, parsley, oregano, lemon zest, onion powder, paprika, cayenne pepper to taste, and 1 tablespoon of salt. Mix into a paste. – Separate the skin from the breast of the chicken by sliding your hand gently between the skin and the meat and working your fingers around. Spread the paste evenly around the breast, beneath the skin. – Place any remaining parsley and oregano, stems and all, along with the stem end and any other onion scraps, the sliced lemon and any other aromatic leavings you happen to find in your kitchen (use discretion) into the cavity of the bird. – Once you’ve gotten your coals fired up, spread them evenly along the left and right sides of your grill. If your grill has baskets on the side for smoking with wood chips, just put the charcoal in those. – Keep the vents open. You want the grill hot (450° +/-) at the beginning. – Place the chicken in the middle of the grill, breast side up, so that it is between the charcoal piles, but has no charcoal directly beneath it. – Cover the grill immediately. – After 15-20 minutes, check the bird. You’re looking for some nice color on the skin. It should look almost done. – When it’s starting to look delicious, close the vents most of the way and sprinkle a little beer (or water, I guess) on the coals to calm them down a bit. You’re aiming to get the temperature inside the grill down to around 300°- 350°. Like this recipe? Be sure to subscribe to my blog for email updates when new posts come out! You can also follow me on Twitter or Instagram. In the middle of the hustle and bustle of the main drag in downtown Milan lies a quaint, warm farm-to-table spot called Taglio. Finally, a place with such an authentic menu that I could barely understand the choices that lay in front of me. “Caprese” and “burratta”, an obvious ‘yes please’. Risotto Milanese, check. The guys were told there was just one two and a half pound t-bone steak left so it was ordered with a quickness. Our waitress came to see what kind of water we wanted (only in Europe can you guarantee that every restaurant, from white table to casual cafe, will make sure you make a decision between still and sparkling) and I took the chance to humbly ask if she spoke any English. “A little ” she said hesitantly. I pointed to what I believed to be a pasta dish. “Yes. Pasta. Very good.” Fine. Sold. The veal, which shows up on every menu in Milan, was the last dish to round out our feast. Perhaps it was the electric mood of downtown Milan, or maybe it was the bottle of white wine we consumed, as if it were water, from room service before we left the hotel, but I’m sure we were the easiest customers to please that night. “Mi scusi, two glasses of rosatii. Grazie.” I didn’t need another glass wine but…yes I did. Our dishes were spaced out perfectly giving us plenty of time to eat, savor and laugh. Also enough time to allow our waitress a chance to sneak outside past the ‘Vietato Fumare’ sign to, one could easily assume, fumato. The guys went after the steak tartare like privileged cavemen. By the time the two and a half pound steak arrived, so did a fit of laughter. Consuming this much meat felt ridiculous and we all knew it, but the dilated pupils of the guys was evidence enough that these two were fully ready to consume this meat, the size of a teenage human head. Eating too much good food is a lot like drinking too much, your eye lids drop to half-staff and you start to stoop over the table in defeat, but if offered more it’s hard to refuse. Our lack of Italian is the only thing that kept us from ordering everything on the dessert menu. We were too exhausted to attempt any lame translation. As we got up to leave, the waitress walked over to the stereo, surrounded by stacks of CDs and records, and put on some reggae. Mood set. Time to go. Back to the streets of Milan to see if we could hail a taxi before we got dangerously close to a gelato shop. “I care about taking care of my customers” he insisted. “You happy, I’m happy.” Our waiter, Mr. Brightside, wanted us to have the best dining experience of our lives and his enthusiasm was so over-whelming, it seemed, his knees got weak. He pulled up a chair, sat down, licked his thumb and index finger and flipped a page on his notebook. “Okay, to begin. Tell me what you like”. His self-confidence was impressive. I trusted him implicitly to lead the three of us through this order. He guided us to dishes we never heard of, listening and assessing our individual tastes and appetites. It was exciting and collaborative. I still couldn’t tell you what we had as Mr. Brightside hand-selected everything we tried. He recommended a creamy curry sauce for me since I liked sweetness. He brought my boyfriend the hottest pepper extract they had (found perched on the shelving above the bar like forbidden fruit) since he said he could handle more heat. The Pepto pink walls and trimming were reminiscent of a Florida beach house. That was, and remained, the only unappealing this about this whole place. In fact, in retrospect, I dare say it added to the quirkiness. We came for a late dinner and this was one of the only restaurants in London that could serve us a good meal at half past ten. It was scarcely populated. A couple, looking like the English equivalent of Tito Ortiz and Jenna Jameson, stayed quiet and to themselves. Another couple, however, walked in about half hour to midnight and her decently intoxicated state made it loud and clear that she was about to turn thirty at midnight. Just as her gin and tonic was placed in front of her, we raised our glasses and started the restaurant-wide sing-a-long of Happy Birthday. Mr. Brightside could not have been happier at this exchange of positive energy. His character lit this already shining gem of a restaurant even brighter. You come here for him as much as you come here for the food. Which, is amazing, by the way. Our chef had recently transplanted to London from Bombay and was “the best” Brightside assured us. Safe to say, we agreed. 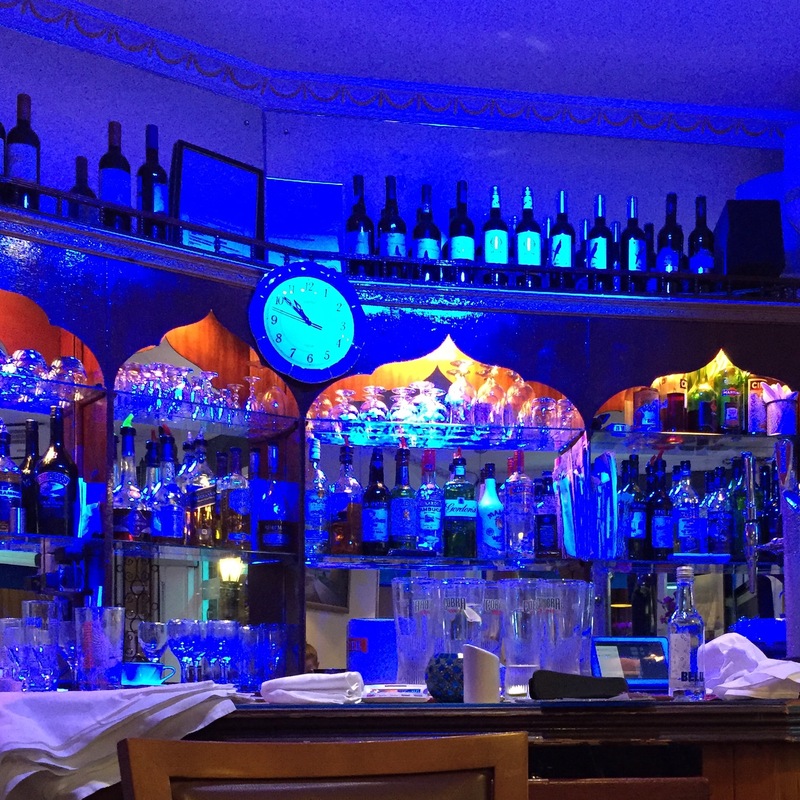 The food, the atmosphere, and our waiter were a perfect introduction to the diversity of culture London has to offer. “You ready to close out already? You can’t go yet. Stay for a glass of wine on me” insisted Jim, our bartender. “Oh. I can’t…are you sure? Thanks. This is the second time this week I’ve been stood up” confessed the 30 something woman sitting next to me, dressed in her sleek black turtleneck, black jeans, and thigh-high boots. Jim had already proved himself a worthy wine pusher by bringing over several bottles of French reds for me to try before committing to a full glass. I liked this guy even more now that he I could see the empathy he wore on his sleeve. 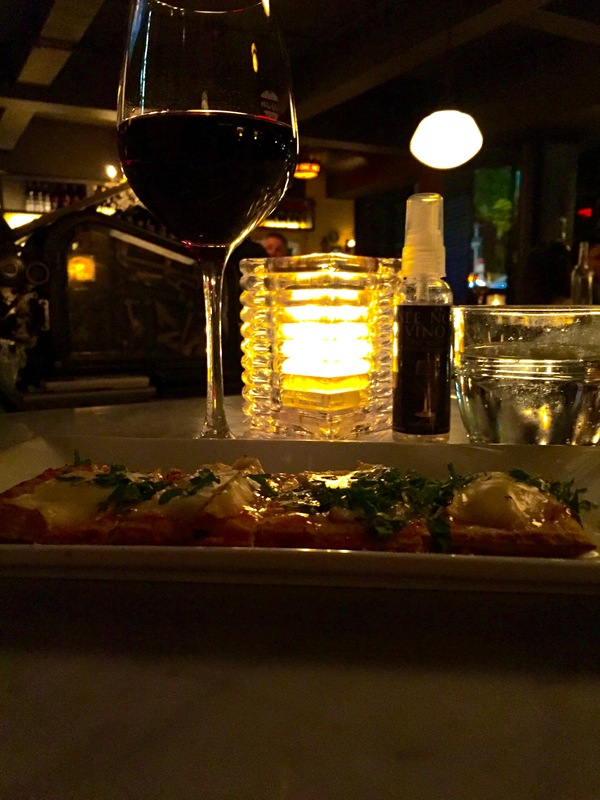 Vanguard, on 2nd Avenue and 30th Street in Manhattan, is a great date spot and a terrible place to get stood up. Something about having to walk downstairs to enter the bar feels exclusive. Like a best kept secret. The dark browns and reds that highlighted this sunken space provided a warm glimmer against the flickering candlelight. An old black and white film played silently above the bar, highlighted by the marble countertop surrounding Bartender Jim. Framed vintage advertisements and French subway maps adorned almost every inch of these walls. The few booths and tabletops that are here sit mostly empty. The draw of the marble bar is irresistible. Some come here solo, looking for a warm space to pull out a journal and start writing. Others come here with friends after work to vent over one too many glasses of Cabernet Franc. And some, like the older couple across the bar, came here to make this spot a wine-tasting, slow-dancing, spot for romance. All of us with the perfect view of the other characters that occupied this space tonight, make it impossible to ignore the girl who was left here alone. I felt bad for her. We all loved Jim’s act of compassion, and now we were all aware of her punctured heart. Silently inserting myself into her situation, I decided that what this woman deserved was a man who knew what he wanted and was confident in his decision. Like the gentlemen who had no interest in tasting anything. He knew exactly the glass of wine he wanted to order. A young man that looked like he was pulled directly out the New York improv scene: black hipster glasses, maroon zip-up hoodie, and New Balance sneakers. Sure, he looked like a kid, but the assuredness and maturity of his ordering style left me with a temporary fantasy that he could be a great fallback for our lonely homegirl. I snapped out of this intrusive daydream and ordered an earthy red, the Camembert and Apricot Preserve flatbread, and a glass of sparkling water. The latter of which I attempted to use to get rid of whatever the yellow stain was that just showed up on my new, white coat. The water helped some, but good ol’ Bartender Jim came through with a helpful follow up, “Did you spill red wine on your coat?” “Oh no. Just some stain I noticed on the way here.” “Oh. Cause I have some of this spray stuff that helps take out red wine stains.” A few pumps and scrubs later, stain be gone. Bartender and superhero. I’ll definitely be back. The California Pizza Kitchen at Emeryville in the East Bay is as deserted by customers as one might expect from this name-brand chain. Like the Top 40s singer who lamented, “I don’t know why I return to the scene of these crimes”, I find myself wondering why I too return to an old, familiar East Coast lunch-time, crunch-time destination. The answer is simple: The savory sweet and delectable crunch of their chicken lettuce wraps paired with an astonishingly affordable Coppola Pinot Grigio ($7). The order tickets, pumping out of the plastic black box in front of me, hang on to each other like a string of Tibetan prayer flags. The expansive space of booths, unpopulated, sit underneath the peppy sounds of the radio, ready and willing to accept the Emeryville shoppers that see the logo and know there is a reliably decent meal awaiting them inside. The string of tickets are evidence enough that this restaurant is doing just fine. And, with staple menu items like the chicken lettuce wrap and white corn guacamole, lunch time guests looking for guaranteed seating find their way here. Attentive bartenders like Cynthia, know exactly why I’m here and are ready to help, “So, the Coppola Pinot Grigio? 6 ounce or 9 ounce?” She knows, and I know. How could you come here, lit by the warmth of the school bus yellow tiles decorating the wood fire oven, and not order the 9 ounce? “He told me I was slow. He told me to smile. I told you I never look at people” she said, slouched over an imitation redwood patio chair and table. Her voice powered only by the little air left in her deflated lungs. Her confidant, eager to be the bootstrap that lifted her up expressed, “The same amount of knowledge and experience you get, you suffer.” What otherwise would have seemed misguided advice, lifted up by the spirited, romantic accent that only a Frenchman could engage in so effortlessly. Salumeria, at the corner of Florida Street and 20th Street, was alive with stressed out 20 somethings, and the late Saturday brunch goers. The overcast sky carried chill breezes and moments of warm serenity. The sidewalk tables offer a calm view of the bikes and pedestrians weaving their way around these city blocks. As I listened to this downtraught girl, I can’t help but notice the building across the street sporting grafetti that reads, “Stress Pressure”. Just underneath a cracked window sporting an “I *heart* SF” and “Vote YES on Prop F” posters. A locally, politically conscience neighborhood. There are more languages being spoken here than I could ever hope to identify. And, although the restaurant supports a light menu and carefree vibe, life finds its way in through those who have made Salumeria their lunch time destination. As she finished off her butterleaf and pepita seed salad, she and I could feel the weight of the pressure she brought with her from somewhere else. High drama on an open-ended sidewalk, perfect for taking it all in, and then, in a fleeting second, letting it all go.